Set within 300 acres of historic ranch land, this lovely resort embodies an air of carefree elegance. 500 well-appointed rooms and suites offer an inviting retreat. A five-acre water park, beautiful nature and jogging trails, a tranquil full-service spa, kids club, and a golf club offer plenty of activities to keep the entire family engaged and happy. 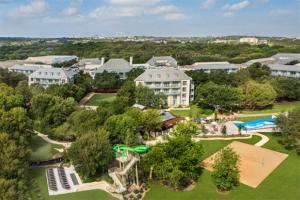 Approximately 17 miles from San Antonio International Airport and the San Antonio Riverwalk. Antlers lodge - Texas cuisine; Springhouse Cafe - Southwestern cuisine; Charlie's Long Bar - saloon; Papa Ed's Pool Bar & Grill - casual dining; Vince's Watering Hole; Windflower Wellness Bar - spa cafe; Cactus Oak Tavern; Aunt Mary's Lounge - handcrafted cocktails and more.